Unchecky Info Tool is a small tool which collects information about a running program. 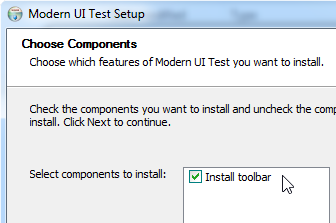 This tool can help us to add support to installers which are not being handled by Unchecky. 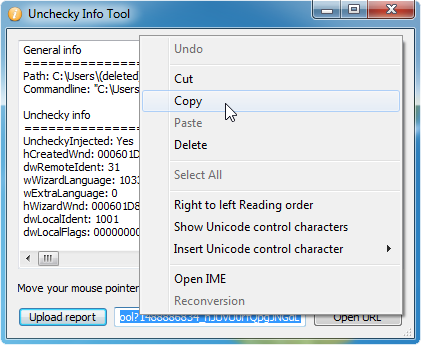 Unchecky Info Tool can be downloaded here. 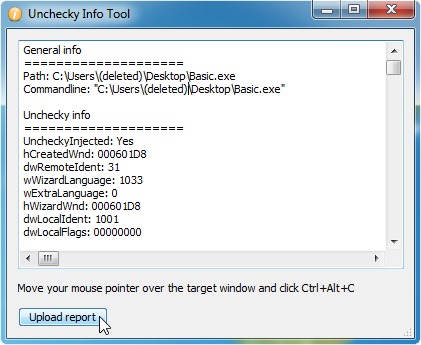 Download Unchecky Info Tool, and extract it to a folder on the computer. Run Unchecky Info Tool as administrator. Hover over the offer with the mouse cursor. Use the Upload report button to upload the report to our server. A unique link will be generated. Note that you can edit the report to mask any private information in the report. Include the generated link with your report. Note that other users cannot see the report behind the link, only you can.